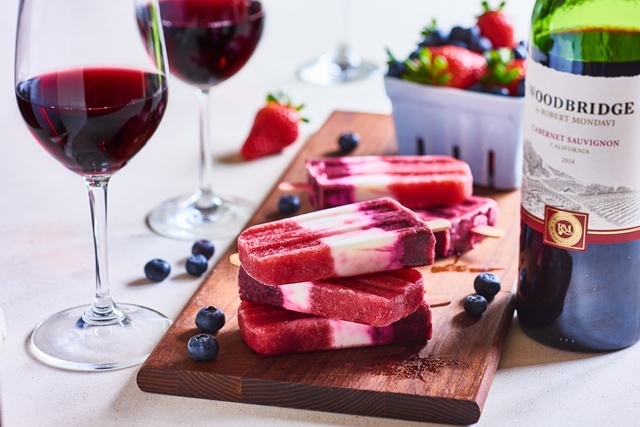 Now that many Valley schools are gearing up for spring break, we think everyone deserves a little time off–even if that just means sitting under the sun with one of these fruity cabernet ice pops courtesy of Woodbridge by Robert Mondavi. Fill the Popsicle molds one-third of the way. Place all ingredients in a blender. Blend until combined. Remove the molds from the freezer and fill each another one-third of the way. Freeze until firm, another 30 minutes. Remove the molds from the freezer and fill each another 1/3 of the way. Leave about ¼ inch of space at the top of the mold. Freeze until solid, about 5 hours. *You may have extra fruit puree, depending on the size of your berries.